This page contains links to articles on the TrackMan Doppler radar system for tracking pitched and batted baseballs. Not much is here right now but stay tuned for updates in the near future. 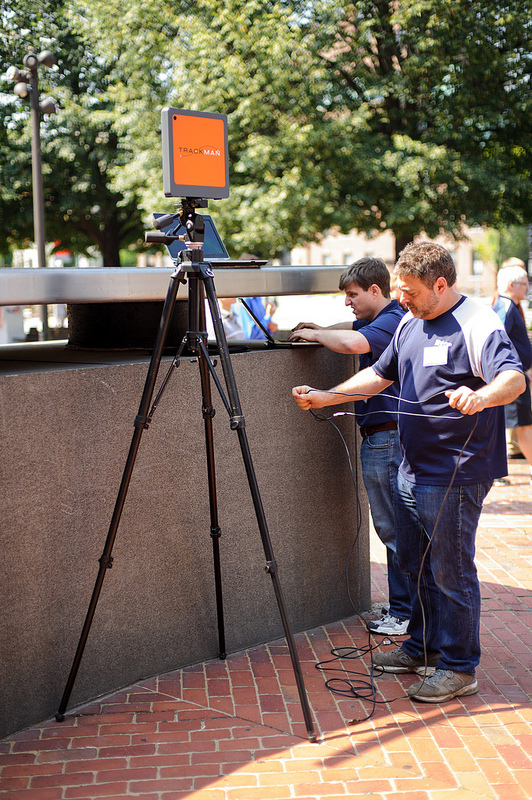 The TrackMan portable unit used in demo at the 2012 Saberseminar. Tracking the baseball with the TrackMan Doppler radar: A brief introduction, a talk I gave at the 2012 Saberseminar in Boston. Testing TrackMan: Just How Well Does TrackMan Work? an article co-authored by Lloyd Smith, Jeff Kensrud, Eric Lang, and myself and published April 2, 2014 in Baseball Prospectus. Distribution of spin differences between high-speed video and Trackman for spin values in the range 1100-3200 rpm. The article reports the results of an experiment we did at Minute Maid Park in Houston in January, 2014, in which we used a pitching machine to project fly balls and line drives from home plate. The balls were tracked with the Trackman device in the stadium. Redundant information about the initial velocity vector and spin were determined from high-speed video, and about the landing point from a long measuring tape. The article compares these two sets of data, such as the spin measurements shown in the figure. Conclusion: Trackman works pretty darn well! Read the full article for more details. Evaluation of Doppler radar ball tracking and its experimental uses, the MS thesis of Jason Martin at Washington State University, December 2012. Jason gives an excellent description of both the general principles of radar tracking and the specific implementation utilized by TrackMan. He then describes experiments done utilizing TrackMan to learn about drag and lift coefficients. Determing the 3D Spin Axis from TrackMan Data: In this article, I develop a technique to determine the direction of the spin axis for pitched baseballs, utilzing the measurement of the total spin from TrackMan and the magnitude and direction of the spin-induced deflection from the trajectory. An accompanying spreadsheet is a template for the calculations. TrackMan, an excellent discussion about TrackMan at Tom Tango's blog from April 2011. The discussion was initially about the article How a Danish tech company is revolutionizing pitching data, by Tom Verducci, which appeared in Sports Illustrated. An Introduction to TrackMan Baseball, a talk given by Rob Ristagno, at the time the Director of Business Development for TrackMan, presented at SABR40 in Atlanta, August 7, 2010, as part of a panel on new technologies in baseball. Method of and apparatus for determining information relating to a projectile: This is the patent application of TrackMan CTO Fredrik Tuxen, dated December 2007. The overall method of using a phased-array Doppler radar device to track a sports ball is presented. A particularly good description is given of the so-called multi-path problem. Determination of spin parameters of a sports ball: This is the patent application of TrackMan CTO Fredrik Tuxen, dated March 2009. It describes the method used by the TrackMan radar for determining the spin rate from frequency analysis and the spin axis from trajectory analysis.